Opening hours: Businesses are generally open from Monday to Friday, 09.00 until 18.00. Shops are also open on weekend. 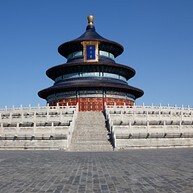 The 400,000 square metres large area is the key historic centre of Beijing. It was here that the former Communist Party leader, Mao Zedong, declared the founding of the People’s Republic of China on 1st October 1949. 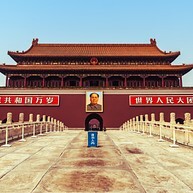 With the famous red building and the giant signature portrait of Mao, this place is definitely the first thing come to might when speaking of Beijing. There are national flag raising ceremonies every day at the time of sunrise. On the first day of every month, the ceremony is the most solemn with a military band. 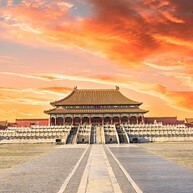 Built by Emperor Yongle in the early 15th century, the 720,000 square metres of Forbidden City was home to the imperial household. It was opened to the public in 1949. The well-preserved area boasts more than 800 buildings and 9,999 rooms. The Hall of Supreme Harmony, beautifully decorated with thousands of Dragons, was used to celebrate the Chinese emperor’s birthday. The Palace of Heavenly Purity served as the emperors’ living area and features several bedrooms. The Summer Palace is a 220-hector imperial garden. The idea was to rebuild a classic view of southern China so that the emperors, as well as the royal families, could enjoy a different atmosphere without even leaving Beijing. 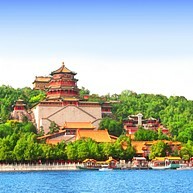 Both the mountain and the lake inside the Summer Palace are artificial. 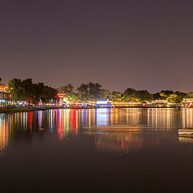 The lake was intended to imitate the famous West Lake of Hangzhou and is even a street alongside the river that perfectly restores the scene of a small northern waterside village. This enormous park was built in the early 15th century, around the same time the Forbidden City was constructed. The park hosts several intriguing buildings. In the north of the park, a stone carved stairway leads up to the entrance of the Hall of Prayer for Good Harvests with its cylindrical blue-tiled roof and a beautifully decorated ceiling. It was struck by lightning and burnt to the ground in 1889 but was carefully reconstructed the following year. The Hall of Abstinence was used by emperors for fasting. In the south, you will find the Round Altar—a three-tiered marble platform. Originally built in 1694 as the residence of the Yongzheng Emperor, this complex of beautifully designed buildings was transformed into a Tibetan Buddhist Temple in the mid-18th century. The Falun Dian, the temple’s teaching and assembly hall, features a large bronze statue of Tsongkapa, the founder of the Buddhist Yellow Hat sect. This well-known modern art centre is based inside a defunct, 1950s concrete factory with works of artists from all over the world. It features photographic exhibitions, video installations, sculptures and other artwork. Displays change regularly. Restaurants and cafes serve fabulous food. This street is a must for antique-hunters: be it Chinese paintings, ancient books, calligraphy brushes or ink stones you are sure to find it in Liulichang. A favourite among calligraphers and scholars in the old days, the 750 metres long street was restored and expanded in the late 1980s. Undoubtedly one of the world’s top tourism destinations, the Great Wall is a stunning monument stretching over 5,000 kilometres. 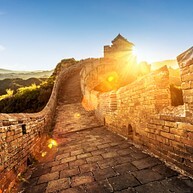 When in Beijing, the most convenient place to view the wall is from Badaling in Yanqing County, situated around 70 kilometres from the Chinese capital. Other sights open for tourists to explore the wall are Mutianyu, Huanghuacheng, Simatai and Jinshanling. Enjoy a performance of acrobatics at the Chaoyang Theatre which was built in 1984. 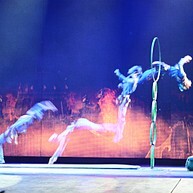 The program contains tricks with cycling and chairs and other magical Chinese stunts. This spectacular show lasts for one hour and it is much appreciated by tourists. Beihai Park is one of the oldest and largest ancient imperial gardens in China which is located in the city centre, and one of its best-preserved parks. 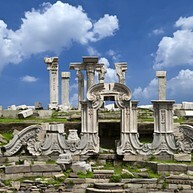 It has over 1,000 years of history and is located just behind the Forbidden City. This is a nice quiet park with a relaxing atmosphere. 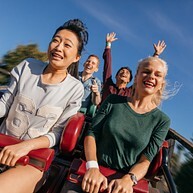 For adrenaline-pumping rides, head over to this theme park which opened its doors in 2006. It consists of 6 themed zones, in total 40 rides, an IMAX theatre complex and a shopping complex. This is a very popular amusement park among tourist and locals alike, so it can get crowded on weekends. National Museum of China (NMC) is one of the largest museums in the world. It focuses on both history and art. You will find NMC on the east side of Tiananmen Square, and you can easily spend a whole day here. 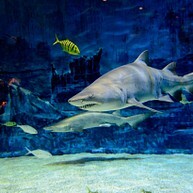 Beijing Aquarium is the biggest inland aquarium in the world, located inside the Beijing zoo. It consists of seven exhibition halls with thousands of marine species, presenting also endangered creatures. In addition, there are shows with adorable animals like dolphins and seals. This is a great attraction for both adults and children. 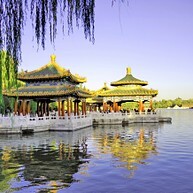 Take a stroll around this lake and around the narrow streets behind the lake, where you will find interesting shops with Chinese arts and crafts. There are plenty of restaurants around the lake where you can have a relaxing dinner and at the same time enjoy the beautiful scenery. You can also rent a boat or bike and explore the area in a more interesting way. Also, this area is one of the most popular bar streets in Beijing, most of the bars have live signers. Beijing Capital Museum was formally open to the public in 1981, and the Confucian Temple was its original site. In order to accommodate a larger collection, a new museum was built in December 2001. There are more than 5000 pieces of cultural relics here like porcelain ware, calligraphy works, paintings, coins, jades, seals and Buddhist statues. Yuanmingyuan is a place steeped in myth. It was allegedly the most wonderous and luxurious imperial garden in Chinese history, with exotic animals wandering the park and rare flowers everywhere, dotted with gold sculptures and stones, with buildings that were built entirely of jade. However, the park was destroyed in 1860 by foreign intruders and local rebellions. Now all that's left is essentially a ruin, but still a beautiful one. There was little first-hand record of this garden and the only image remaining is a painting.